This assignment solution is based on 2018-2019 IGNOU assignment question paper which must submit in March'2019 for appearing in IGNOU June examination & September'2019 for appearing in IGNOU December examination. Assignments with good solution help student to gain better percentage because of its 30% weightage in final marks hence we recommend every IGNOU student to write & submit best solutions which is only available here. All assignments are prepared by professionals based on 2018-2019 Assignment question paper for excellent result. 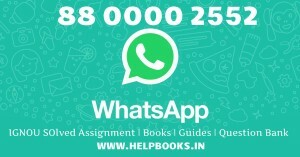 Helpbooks.in gives money back guaranty in case of any dispute or mismatch and our team is always ready to help all IGNOU student. All assignments are in instant PDF format which would be send on email/WhatsApp just after payment. WWW.HELPBOOKS.IN is a verified & secure website since April'2013 to help IGNOU students. All Payment methods are certified by top Payment gateways i.e. PayPal, PayU, PayUMoney and more. You need to search/select your subject code then add to cart. Fill contact details i.e. Name, email ID, Mobile number etc. Complete the checkout process by choosing secure payment options i.e. Credit Card | Debit Card | Internet banking | PayU | PayUMoney | Paytm | PhonePe | Google Pay | Paypal with secure Gateway resources. After successful order, PDF copy of Assignment will be delivered to you on email instantly. Assignments are for help and reference purpose only. Call | WhatsApp on 8800002552 | 8800397766 | 8800791663 | 9891869487 for any Assistance.